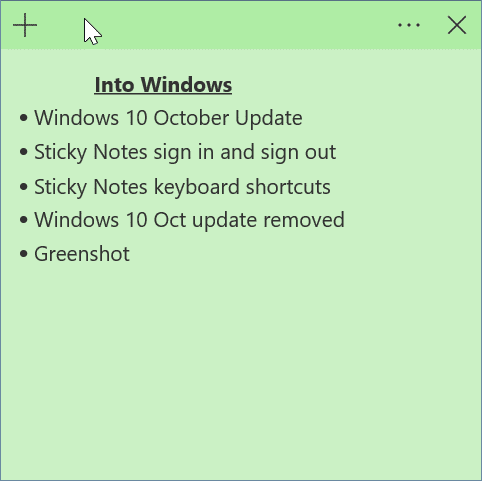 Microsoft recently updated the Sticky Notes app for Windows 10 to version 3.0. The new Sticky Notes app gets many new features including cloud sync, dark mode theme, ability to view all notes at one place, light color shades, format bar, and a few more keyboard shortcuts. In earlier versions of Sticky Notes, we had to use keyboard shortcuts to access formatting options. Luckily, with this version, there is a dedicated format bar to quickly format notes. If you prefer using keyboard shortcuts over the mouse, there are exactly 17 useful keyboard shortcuts for Sticky Notes for Windows 10. Most of these keyboard shortcuts are easy to remember as they are common keyboard shortcuts that you find in other text editing applications like Office Word. Here are the 17 useful keyboard shortcuts for Sticky Notes in Windows 10. NOTE: Some of these keyboard shortcuts might work only in 3.0 and later versions of Sticky Notes. Most formatting keyboard shortcuts work in earlier versions as well. How to sign in and sign out of Sticky Notes in Windows 10 guide might also interest you.